Can My Labor be Photographed or Filmed? Filming or photographing the birth of your child is an extremely personal choice, but not all hospitals, birthing centers or obstetricians allow you to make that choice. Hospitals have the right to allow or restrict filming and photography during labor and delivery as do obstetricians and staff. Many expecting parents think they should have the right to choose, but there are moral and legal factors couples should take into consideration before making a huge deal out of the issue. 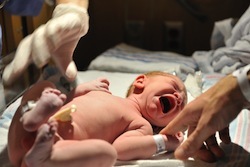 Taking pictures in the delivery room could mean catching the face of hospital staff. Those pictures cannot legally be shared with social media sites without the permission of everyone in the photo. Then there is the legal issue. There has been more than one lawsuit against hospitals and medical professionals due to malpractice issues caught on film. While parents have the legal right to sue, taking videos may be the reason why hospitals are saying no to the camera. You'll have to check with hospital staff and your obstetrician to learn the filming and photographing parameters set up for the labor and delivery process.